You want to make a carrot cake. Your husband loves it. It’s his favorite cake. He dreams about eating it for his birthday every year. That lush combination of plump cake filled with raisins and walnuts and the grated carrots lending a mild earthy sweetness to the cinnamon hints make each forkful taste like full-bodied celebration. This is no fluffy dry cake-from-a-box. This is cake made with love. Of course you want to make it for your husband. Problem is, you have to be gluten-free. You’ve never made a gluten-free carrot cake. You’ve never made a gluten-free cake that didn’t come from a mix. You’ve tried a few recipes but they all seemed to call for multiple weird-sounding flours, xanthan gum, and other ingredients you don’t have in the house. (Even some of the older recipes on this site are like that.) And you want that cake to be good. 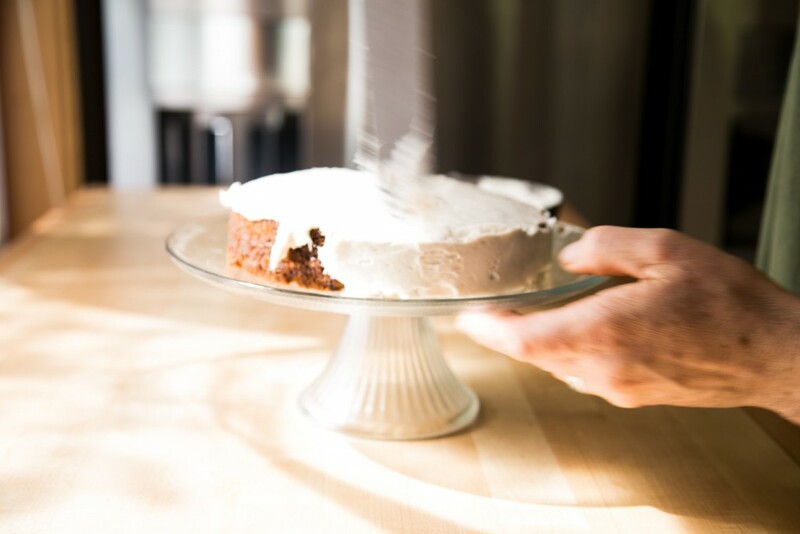 You wish you could just make the carrot cake you have made every year, without the gluten. What do you do when you want to convert a much-loved recipe to make it gluten-free and delicious? 1. Start with a flour blend you trust. Of course, I’m going to recommend you give our gluten-free all-purpose flour blend a try. We’ve worked for years, testing and trying every combination of flours we thought might work. We’d like to tell you that we believe our flour blend is the best on the market. Not only is it the right combination of proteins and starches to make a great baked good, but it actually tastes good. Hundreds and hundreds of people agree with us. Give our gluten-free flour blend a try. But you might have a flour blend you already like, one that is easy to use and works for you. Good! Stick with it. If you have one you feel makes great baked goods, then go forth and bake. Just make sure the flour blend works for your family and doesn’t require extra ingredients. It should work — as ours does — as a one-to-one replacement for traditional wheat all-purpose flour. 2. Measure your flour by weight, if you can. I’ve written so many times about the way that baking by weight improves your baked goods that I don’t want to repeat myself here. If you have a scale, pull it out now to start baking gluten-free. If you don’t have a scale, may we recommend this one to you? Weighing your flours as opposed to measuring them in cups really makes a difference in gluten-free baking, in particular. (But every professional baker weighs flours. They don’t measure out 18 cups of flours for a recipe at 4 in the morning in a bakery!) Each of the different gluten-free flours has a different weight and density. 1 cup of teff flour is not the same as 1 cup of potato starch. At all. Do yourself a favor. Weigh your flours. We use 140 grams for 1 cup because folks we truly trust like David Leibovitz and Dorie Greenspan use that measurement. You might see some folks using 120 or 125 grams for a cup. That’s up to you. If you make a banana bread recipe, and you feel it comes out a little too heavy, use less flour the next time. But seriously. 140 grams for 1 cup of gluten flour works for us every time. If you just can’t make the switch, then you should know this. We formulated our flour blend to be a 1:1 replacement for gluten all-purpose flour. Just be sure to sift the flour, scoop it into a measuring cup, and swipe off the excess with a butter knife. There. You can use cups! 3. Choose a great recipe to adapt. This may seem obvious to some of you. Choose the recipe that has been handed down from generation to generation by people who really love to bake. Your grandmother’s pecan pie recipe card wouldn’t be food-stained and dog-eared at the edges if it hadn’t worked well. And the weird jell0 mold with grated cabbage and mandarin orange slices that your aunt made for family gatherings? No one asked for that recipe. Choose the recipe that works, every time. Now this might not be easy if you are new to gluten-free. Not only do you have to bake without gluten but you might be baking for the first time. So many of us were raised on packaged foods that we don’t know how to make a cake without dumping the dry ingredients out of a box. And pie still intimidates a lot of people. We’ve googled a lot of recipes just to see what comes up on the first page. I’m sorry to say that the results are haphazard, at best. Some of those recipes weren’t created or tested well. Instead, they sit on websites with big staffs who know how to SEO the heck out of those sites to get them high on the google rankings. That’s not necessarily what you want. Who do you turn to when you don’t know a good recipe? Here are some of our favorites bakers in the world. Whenever we have converted their recipes, we eat well. And here are some of our favorite fellow bloggers, people with great taste who choose great recipes to play with in the first place. There are so many others, of course. So many good people doing good work out there. We’d love to hear your recommendations for places to find great recipes as well. 3. Don’t make too many substitutions. This one is tough, of course. If you find that you can’t eat eggs and dairy besides gluten, you’re wandering in the wilds at first. My suggestion? Find blogs you trust that use those restrictions as a place to start eating well. We highly recommend the work of our friends Tom and Ali at Whole Life Nutrition. They eat well and joyfully without many of the foods so many Americans commonly eat. We love their recipes and use them often. However, if you start with a traditional recipe, replace the gluten flour with a gluten-free flour, use flaxseed gel as a replacement for the eggs, and then a bit of almond milk (and then you run out of it so make up the rest with coconut milk), and that cake turns out funny and lumpy? Well, you made too many substitutions. Danny had a head chef once who insisted on this: make the recipe as written once, so you know it. And then you can change it. It works. We make any recipe we want to convert once with our gluten-free flour and no changes. And then we assess. What do we want to do differently? Coconut oil instead of butter? Honey instead of sugar? Ginger instead of cinnamon. I used to teach my students — long ago when I was a high-school English teacher — that they needed to learn the rules of grammar so they could break the rules later. The same goes for baking. You still want to make that carrot cake? Enter Barefoot Contessa, the estimable Ina Garten. I adore her, for many reasons. But mostly, her recipes work, every time. I’ve read a couple of times that she tests every single recipe in her books the same way: she writes the recipe, then watches her assistant make it in front of her and notes down any inconsistencies or places that are not clear, then changes the recipe and asks someone else to cook the recipe in front of her. (Wouldn’t it be a little bit intimidating to cook for Ina Garten?) Danny and I test and test our recipes, and the ones for cookbooks we send out to people who patiently make the recipes in their own homes. But we don’t have the means to follow her method. Some day, perhaps? 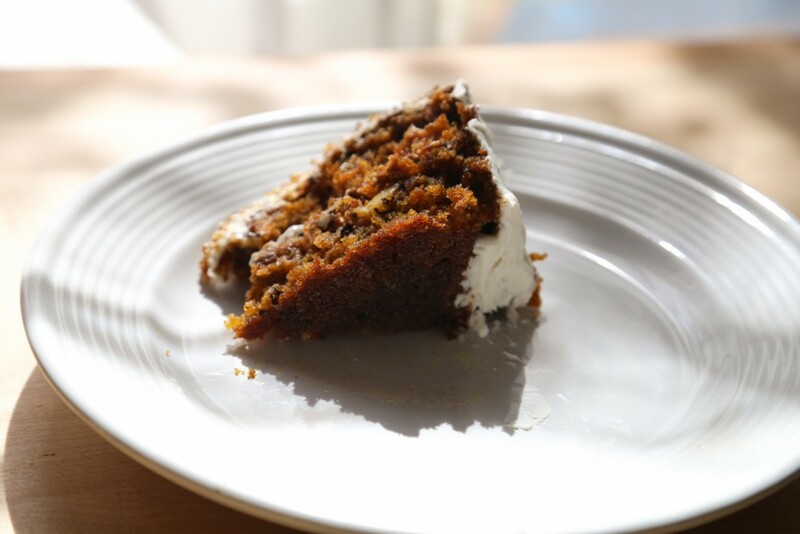 So last week, I converted her carrot cake, using our gluten-free flour. We loved it. And then we wanted to tweak it. So we made it again. We used melted coconut oil instead of vegetable oil. (Coconut oil has a wonderful unctuousness that makes cakes soft on the tongue.) We used a bit of coconut sugar for its caramel taste, along with organic cane sugar. Next time, I’ll add ginger with the cinnamon. And suddenly, this cake was ours. There were empty plates, licked-clean forks, and happy smiles after this cake was served. That’s all you want, in the end. Your cake doesn’t need to look just like the gluten version. You just want it good. 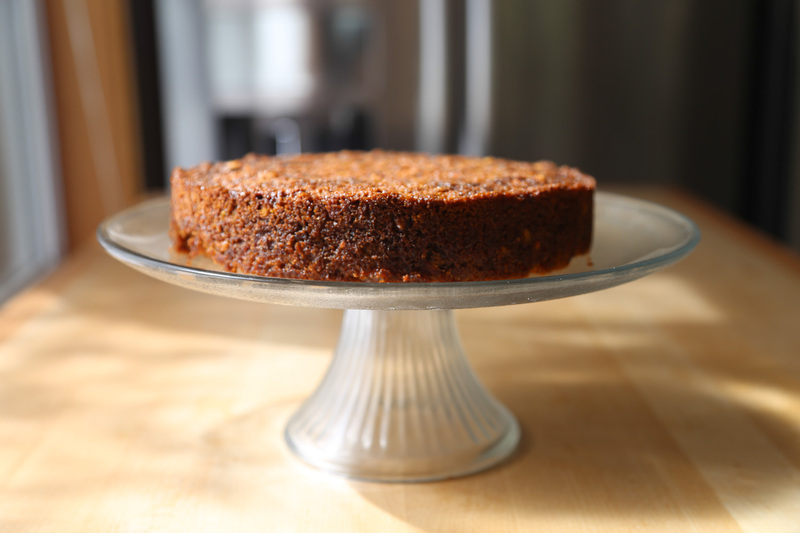 Years ago, Danny and I developed a gluten-free carrot cake recipe we loved. (It’s in our first cookbook, Gluten-Free Girl and the Chef: A Love Story with 100 Tempting Recipes .) It’s still a great recipe, made with fresh carrot juice we reduced slowly until it’s no more than a puddle of concentrated carrot juice. But we don’t make it anymore. With two kids and busy lives, even we want the cake that’s easier to make. Prepare to bake. Heat the oven to 400°. Grease 2 9-inch round cake pans, line the bottoms with greased parchment paper rounds, then sprinkle a little gluten-free flour on the bottom and sides. Combine the dry ingredients. Whisk together the flour, cinnamon, baking soda, and salt in a large bowl. Set aside. Make the batter. Add the sugars to the bowl of a stand mixer. With the mixer running on low, slowly add the melted coconut oil. When the sugar and oil are creamy, add the eggs, one at a time, until the mixture is light yellow and fluffy. Add the vanilla. With the mixer still running, add the dry ingredients, a bit at a time. When all the flour has disappeared into the batter, add the grated carrots, raisins, and walnuts. Mix until everything is fully incorporated. Bake the cakes. Divide the cake batter evenly between the two prepared pans. Smooth out the tops. Bake for 10 minutes, lower the heat to 350°, and bake the cakes until a toothpick inserted into the center comes out clean, another 30 to 35 minutes. Cool the cakes in the pans for 15 minutes, then turn them out onto a cooling rack. Let them cool entirely before attempting to frost them. Dan Lepard is one of my favorite bakers in the world. Devoted to the craft and friendly to boot, this man knows his stuff. I wanted to make a vegan cream cheese frosting that didn’t include vegan cream cheese. I wanted the texture and sweetness of cream cheese frosting without using a lot of expensive ingredients I don’t normally buy. When I asked on Twitter, Dan sent me this recipe of his. Oh my, people. Oh my. Melt the coconut oil, then pour it into the bowl of a stand mixer. Add the tahini, lemon juice, almond milk and powdered sugar. Run the stand mixer on medium speed until the frosting is thick and creamy. If you let the frosting sit for a few moments in the bowl, it will hold its shape even more firmly. 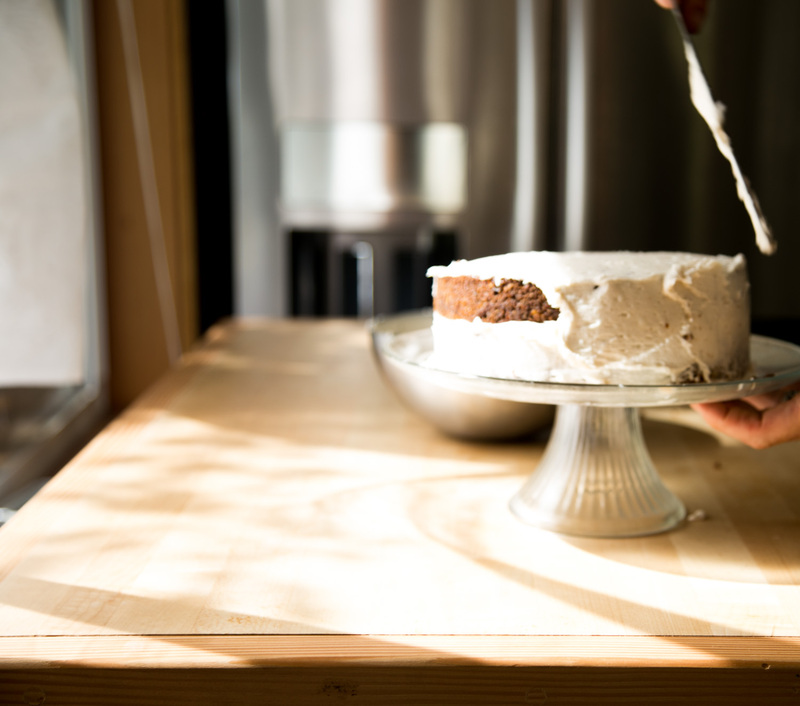 Spread the frosting on each layer of the carrot cake and over all the sides. You know, I’m not a big Stevia fan. The taste of it is pretty awful, to me. So no, I haven’t. But I know there are some great blogs out there that can help! Heaven, I’m in heaven! A new recipe! More sources for excellent foods! More real living from Shauna! Farmers market tomorrow! You have changed my whole outlook on food, Shauna, since you began all this. Thank you. Thank you so much, Ginny. You made my day. Yay! I have been wanting to bake and suddenly this post appears! I can’t wait to start. I just recently went gluten free to help with some digestive problems. I found your blog through Google and I love it! Do you add xanthun gum to cake or quick bread recipes? I just got King Arthur’s Multi Purpose blend and it’s doesn’t have any xanthun gum. Do I just substitute it 1:1 for the regular flour or is there another ratio I should use? You just substitute 1:1 for regular flour with blends like ours or King Arthur that do not contain xanthan gum. You certainly don’t need the gums to make a great cake! I love carrot cake! Maybe I will make a version this weekend for Easter. I have more of a general question, since we had all that Ratio Rally fun back in the day with using weight conversions for recipes…. is your flour intended for 1:1 replacement by volume or by weight? I noticed the mass of 1 cup of your flour is slightly different from typical listed masses of 1 cup AP flour, so am just curious as to your recommended strategy for doing the actual substitution with GF flour, because I was a little unclear from your post today as to the best way to go about it. Thanks! Thanks, Jenn. I added a section about baking by weight and how to convert to the post now. I had forgotten it can’t be implied here! 140 grams for 1 cup of flour is pretty much industry standard here. As I wrote, some use 120 or 125, but I’ve seen the cookbooks authors and bakers I respect the most use 140. And it always works for us. Interesting note about the coconut oil – I’ll have to remember that. I was never much of a cake baker to begin with, and, for a number of years, now, I’ve lived in the world of 59 things to adapt before I start baking. Then take away gluten! (But wait – gluten was one reason I wasn’t good at cakes… hmmm…) So right now I’m storing away ideas and information, waiting for the day they come together in my mind into something I can use. So thank you for sharing information and ideas and explanations! So many people say “You have to use this” – you say why – what it does, how it contributes. That is so helpful, as I navigate the early stages of yet another adaptation. I’m so glad to help. I’ve been to afraid to bake something on my own. That list of “flours” and then never knowing (or recalling) if my one all-purpose flour truly is cup-for-cup. So glad to read this. I might even give this a whirl this weekend. Do! As I like to tell people, it’s only baking. What’s the worst that could happen? And the process is such a joy, a chance to learn. Our flour blend sifts easily. In fact, I’m pretty sure it’s even better when sifted. I’d love to hear how your finicky cake works out. But seriously, try this one. Not finicky. So good. What is the point of a vegan “cream cheese” frosting for a carrot cake that contains eggs? It’s for those who have to be dairy-free. If you know how to make a cake without eggs, with something like flaxseed, then I’m sure you could do it here. I had to go gluten free starting late last week due to wheat intolerances and boy am I happy to have found your website! I’m all new to this GF baking and honestly, I still cry a little because nothing’s turned out quite right yet that I’ve baked. Question: My blueberry muffins rise a little in the oven but sink back down. Is there a difference in the way baking powder vs baking soda works with GF flours? Is yeast better? Hey Ashlie, congratulations on finding out what ails you! The blueberry muffins depend on the recipe and flour you are using. I don’t have an issue of our muffins sinking at all. Make sure you’re using a great recipe and flour blend to start! And then, a little trick. Start your muffins at 425° for 10 minutes, then drop the temperature to 375°. That promotes oven spring and helps the muffin hold its structure. Neat- I will definitely try that! I followed the blueberry muffin recipe from Bob’s Red Mill 1 to 1 GF flour. I was wondering about time and temp to do this recipe as muffins. I’m the only gluten free eater in my family and a whole cake is intimidating — not making it, eating it. Thanks. I haven’t made this into muffins yet. However, I bake all our muffins at 425* for 10 minutes, then lower the temperature to 375* and bake until they are done (usually 20 to 30 minutes). It’s worth a try here! I love when you post. I love it more when we get a new recipe. If you just wrote, however, and never left us something to cook, I would keep coming back. This is such a treat. I have so many additional food challenges since having to go g.f., and while that was challenging in and of itself, I always appreciate when recipes work from the start, without having to fuss with them too much. I love that the frosting has no dairy. I have to follow what is essentially a vegan diet for health reasons, but I can eat eggs, and so I do, because I did not commit to a vegan lifestyle, and it makes my restricted diet a little easier. This recipe is a gem. My husband loves carrot cake. We will leave the walnuts out for allergy reasons, and I think I will surprise him with it when he gets back from his sisters house on Easter day. I haven’t baked anything in almost a year. It will be good to be back in the kitchen. Thank you so much, Beth. I hope you did go into the kitchen to bake! It’s such a soothing space, even when you have multiple food intolerances. With practice, I’m certain you could create great thins. Hi, I was wondering about high altitude alterations? I live in the Mile High City and usually have trouble getting my breads to rise using gf flour blends. I’ve tried many, and they all do the same, sit like a brick. Any tricks for those of us at higher altitudes? I’m so sorry but I don’t know any high altitude tricks. We’re at sea level! But again, when you use the template of a gluten-free bread dough being more like a batter (pancake batter! ), it’s not really so much about rising as hydration over time. We might post a new sandwich bread recipe soon. Maybe you can adapt it for high altitudes for us? This looks great, Shauna. For those of us without a stand mixer, is it really important to have the oil and sugars beat to creamy? Should I put them in a blender or my little two cup food processor (it works for everything!) and then put it in a bowl with the vanilla and added the dry ingredients? Or would an immersion blender work for the eggs and sugar? Bo, you should make the cake based on the appliances you have! I’d do it by hand or with an immersion blender, rather than the blender. That little 2-cup food processor might work, if it’s not too small! I know how creative you are. You can make it work. Love, love, love how you make gluten free and vegan taste so good. How many cups of carrots does 1 lb make? IT’s usually about 4 to 5 large carrots that make 1 pound of grated carrots, Barbara. And thank you! Hurray! I have been trying to decide what to make first with the flour from your Kickstarter campaign. It was my cast iron skillet cornbread. This is one of those tried and true recipes as you suggested in your post. And–it was a great success. We tolerate little messing around with our family cornbread recipe. The flour performed perfectly, and cornbread was “the same as” its predecessor. Many thanks! You two have done a great job with your research. I can’t wait to hear more about the grain-free blend when it is ready. This is such good news! I’m so glad that it worked out well for you. That’s what we wanted! I have been looking for a gf carrot cake for over a month now! I made this on Saturday for our Sunday celebration of Easter and it was amazing! I even had to improvise with sugars (I used coconut, brown, and a tiny bit of cane), gf flours (2 different blends, brown rice, and sweet rice), and make it sans raisins (my husband hates them). I did however make a cream cheese frosting to keep with tradition. It was GREAT! The best carrot cake I have ever made for Easter, which is a 5-year tradition for me. My family was so impressed they wanted the recipe. I felt so affirmed in my decision to go gf for health reasons over a year ago. Thanks for your knowledge and willingness to share it with all of us! It is making my gf life better. Love you Shauna! This made our day! I’m so happy you and your family loved the cake so much. And as you have shown, it’s adaptable. You made it yours. Thank you! Thank you, Molly. Your work is just gorgeous, of course. And congratulations again on your wedding! My husband loves and really misses carrot cake. I wanted to work up to this cake and so I made Ina Gartens 2012 blueberry muffin recipe. WOW! I just followed the recipe using your GF flour. Great crumb, very moist, nice flavor and the next day they had not turned into hockey pucks. WOW! I didn’t even let the batter sit overnight. I am going to make another batch using a fresh can of baking powder and let the batter sit overnight. Then it will be onto the carrot cake. WOW! I’m thrilled! You can bake anything you want for your husband now. And for you! Shauna, thank you for teaching me how to substitute gluten free flours in recipes using gluten containing ones! I learned it from you years ago and it has allowed me to continue to use old favorite recipes without interruption. My family eats gluten free and they, on most occasions, cannot tell the difference between the old gluten favorites. That is thanks to a great flour blend that I love and that I learned to make from your website. I cannot thank you and the chef enough for all that you have taught me! Best of luck on your new venture into selling your flour blends! Blueberry muffins version 2. I bought new baking powder and let the batter sit overnight. The muffins turned out even better than the first batch. I made them following the regular Ina Garten recipe using 140 g of GF flour for the regular flour and no other changes. I made a batch with Buttermilk and butter and another batch with Sour Cream. We liked the sour cream ones a little better. Now on to chocolate chip cookies and carrot cake. I agree that the GLUTEN FREE GIRL advice, instructions and recipes have provided my Celiac family with great foods to eat. From birthdays to Thanksgiving we have been happy. The new GF flour blend just makes it easier. Wow! 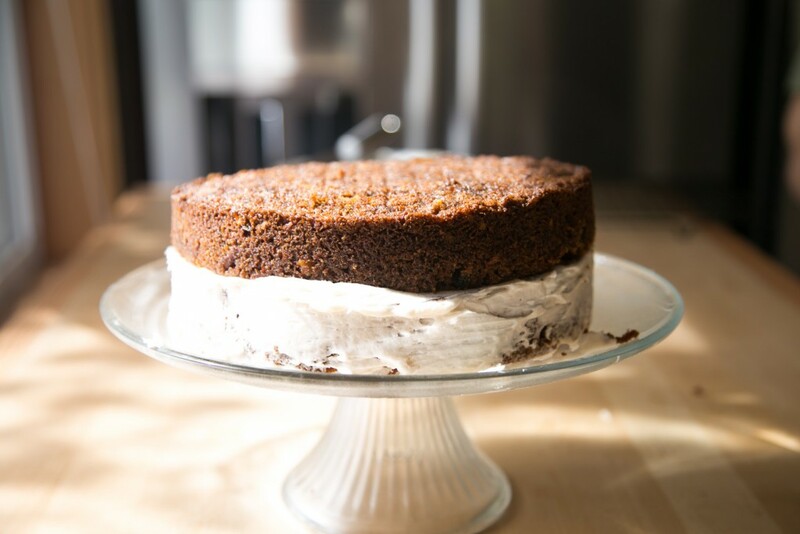 I adore Carrot Cake, so thankful to have a gluten free version that I can trust! Shauna, thanks again. I made this last night, played a bit with the sugars (used what I had), and came up with a variation on the icing (out of tahini so subbed peanut butter (only nut butter on hand). Threw in a dab of brown sugar for the icing. 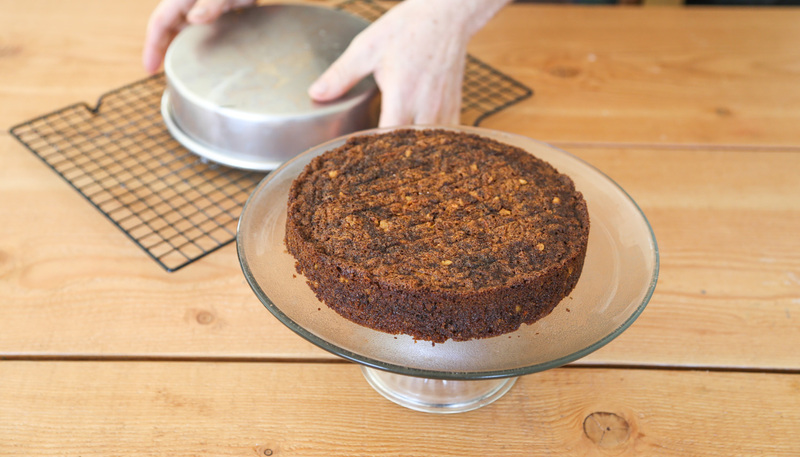 The result is a rich, almost maple topping, enough to frost the entire cake, and the layers. Thanks again!